The Edmonton Rush defeated the Toronto Rock 11-10 in Game 2 of the Champion’s Cup Final on Friday night to win the series 2-0 and capture their first Champion’s Cup in franchise history. Edmonton forward Mark Matthews was named the Champion’s Cup series MVP and capped off the final with 5 goals and 3 assists. Not to be outdone, Aaron Bold was sensation in the Rush goal making 32 saves, many of the spectacular variety. The day didn’t start well for the Rock as their leading regular season goal scorer Brett Hickey rolled his ankle at the morning shoot around and it was quickly determined that he would be unavailable for Game 2. Rock captain Josh Sanderson opened the scored by finding some room between the legs of Edmonton goaltender Aaron Bold 4:06 into the opening quarter. The two teams exchanged goals from there and the Rock led 2-1 after 15 minutes. Miller was outstanding in the Toronto goal; stopping 12 of 13 shots fired his way. Edmonton and Toronto traded punches and goals through the first 10 minutes of the second quarter. Down 4-3, Edmonton’s Matthews tied the game for the fourth time in the first half. With 5 seconds remaining, Edmonton called timeout and would begin with the ball deep in their own end. A perfect series of passes moved the ball up the floor quickly and opened up Matthews for a last second shot that beat Miller to give the Rush their first lead of the game, 5-4 going into the halftime break. The Rush built a two-goal lead, 7-5 a little over 6 minutes into the third quarter. Toronto went on a 3-goal run capped off by a great finish in tight from Colin Doyle to take an 8-7 lead. It appeared as though Kevin Crowley had scored to give the Rock a 2-goal lead of their own, but an Edmonton challenge overturned the call on the floor. 11 seconds later, the Rush scored to tie the game and swing the momentum heading to the final 15 minutes tied 8-8. After Rock defender Damon Edwards took a major penalty for boarding, Toronto was able to generate a shorthanded marker from Rob Hellyer to take a 9-8 lead. Matthews scored his fourth and fifth goals of the game; one on the power play and one shorthanded to shift the balance of power back to the Rush. With just 2:18 remaining Doyle made a great move on the crease to tie the game 10-10. Every second was even more tense than the previous one in the final moments as Matthew Dinsdale scored with just 1:02 remaining to give Edmonton an 11-10 lead. The Rock had several chances in the final seconds but were unable to beat Bold and the Rush ran out the clock and the celebration in Edmonton began. Toronto is now 6-3 all-time in the Champion’s Cup final and last won the championship in 2011. 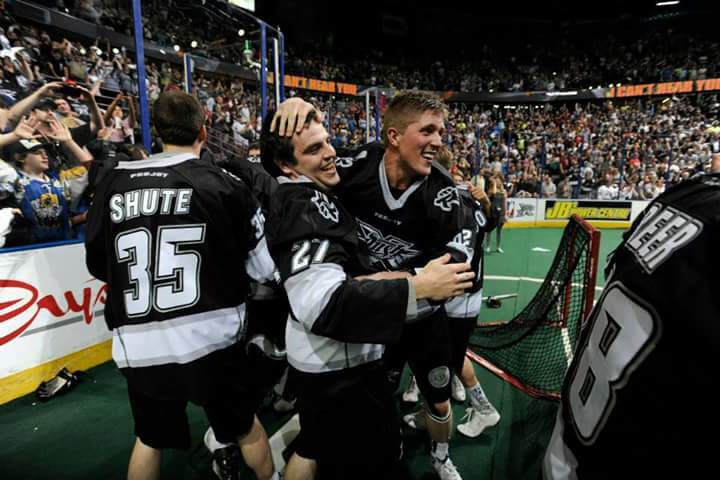 The Rock, along with the former Philadelphia Wings franchise, share the NLL league record with six Champion’s Cup titles. The win for the Rush was the first in the team’s 10-year history.